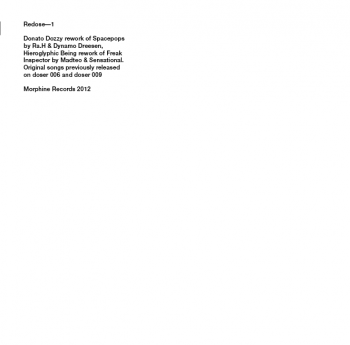 Donato Dozzy rework of Spacepops by Ra.H and Dynamo Dreesen, Hieroglyphic Being rework of Freak Inspector by Madteo & Sensational. Original Songs previously released on doser006 and doser009. Music by Rabih Beaini, Dynamo Dreesen, Madteo, Sensational, reworks by Donato Dozzy, Hieroglyphic Being. Artwork by Tankboys.